Four spikes protrude out from the knuckles causing maximum damage. These knucks have a solid construction with an antiqued silver finish. 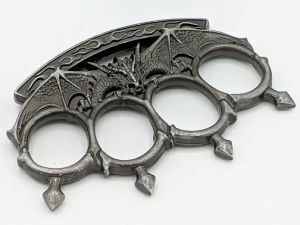 Etched into the palm grip are flames with a dragon just stretching his wings showing off his fierceness. This piece is constructed of steel with large 1x1 finger holes and overall width of 3.25 inches. Overall length is 4.50 inches.